Scientists at Carnegie Mellon University (CMU) developed a low-cost 3-D bioprinter to print living tissue by modifying a standard desktop 3-D printer and released the design as open source so that anyone can build their own system. 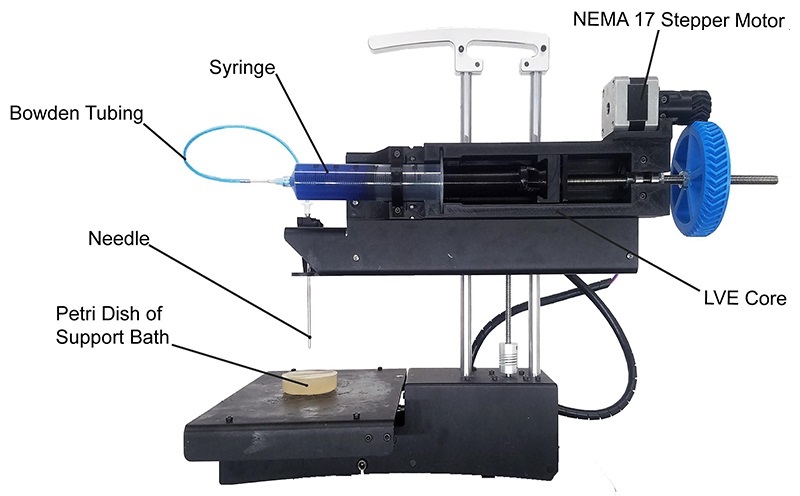 The biomedical engineering team led by Carnegie Mellon University (CMU) Associate Professor Adam Feinberg, Ph.D., BME postdoctoral fellow TJ Hinton, Ph.D. just published a paper in the journal HardwareX describing a low-cost 3-D bioprinter. The article contains complete instructions for modifying nearly any commercial plastic printer, as well as printing and installing the syringe-based, large volume extruder. CMU’s 3D bioprinter for DIY bioprinting. Credit: Prof. Adam Feinberg/HardwareX (adapted). As the CMU scientists explain in their paper, most commercial 3-D bioprinters currently on the market range from $10,000 to over $200,000 and are usually closed source, proprietary and difficult to modify. The high cost of 3D bioprinters is a deterrent to many scientists who want to bioprint organs to use in research. Hopefully, CMU’s open-source bioprinter will speed up the pace of biomedical engineering. Bioprinting organs do more than counter the growing shortage of donor organs. Those bioprinted organs that are made with a patient’s stem cells have far less risk of being rejected as foreign tissue. As it stands now, recipients of donated organs need to stay on immunosuppressants, such as rapamycin, for the rest of their lives to prevent their bodies from rejecting the new organs. The medical applications of 3D bioprinting are rapidly advancing due to the shortage of donor organs. The potential of bioprinting organs has started somewhat of a gold rush, as companies flood into the field. In February, for example, a startup called BioLife4D announced plans to bioprint human hearts using stem cells from a patient’s own body. 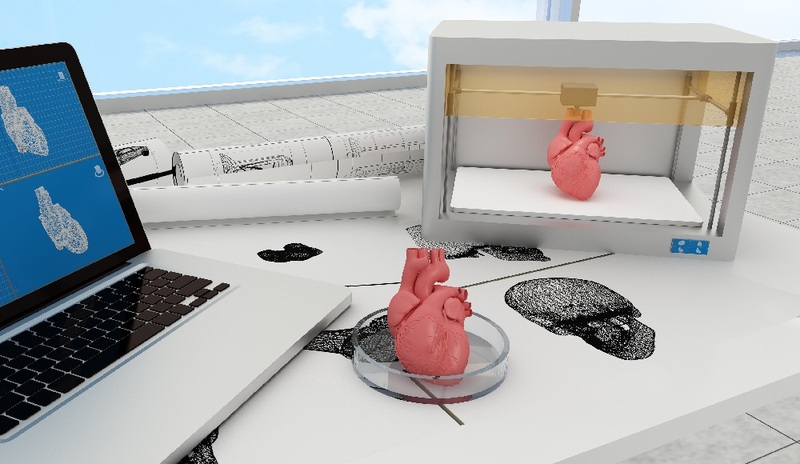 Some predict that it will be possible to print fully functional organs in a few decades, meanwhile more research is required to make 3-D bioprinted organs a viable solution. This low-cost 3-D bioprinter enables more scientists to research and develop bioprinting technology. Not only does the large volume extruder cut down on cost, but it also allows researchers to print artificial human tissue at a higher resolution and on a larger scale, paving the way for researchers, professionals, and scientists to experiment with 3-D bioprinting. The process of bioprinting a human organ starts with a tissue sample from the patient. Technicians convert the patient’s cells into induced pluripotent stem cells (iPSCs). The iPSCs are then transformed into organ precursor cells which are then fed into the bioprinter. To create the bioink, technicians mixed the precursor stem cells with nutrients and growth material. The bioink is loaded into a 3d bioprinter, a highly specialized printer that prints out the new organ one layer at a time. Since the cells aren’t fused together yet, a support scaffolding is printed with each layer to hold them in place. When the printing process is complete, technicians move the bioprinted organ into a bioreactor which mimics the conditions within the human body. The organ stays in the bioreactor to mature, and the cells self-organize into groups of living tissue. Once the organ is ready, technicians dissolve the scaffolding, leaving behind a living organ. In their paper, the scientists demonstrated the system using a standard biomaterial for 3-D bioprinting called alginate and employing their Freeform Reversible Embedding of Suspended Hydrogels (FRESH) technique. Professor Feinberg’s team intends to publish more open source biomedical research for other scientists to expand on. By making their research widely accessible, Dr. Feinberg’s lab hopes to widely seed innovation, encouraging the rapid development of biomedical technologies to save lives. While decades away, the idea behind bioprinting organs is not far-fetched, as scientists have produced many types of organ tissues in the lab, including liver, pancreatic, kidney, lung and heart tissue. For example, researchers at biotech startup ViaCyte developed a pancreas-in-a-box using stem cells and are putting them into patients as part of a clinical trial. While not a full-sized organ, the pancreas-in-a-box contains pancreatic tissues that produce insulin, a daily treatment for type 1 diabetes. In another example, a team in China transplanted lung stem cells to regenerate several patient’s lungs. The transplanted stems cells developed into new lung structures in a small trial, say the researchers, including alveoli and bronchi, regrowing and repairing the lung tissue of patients with respiratory disease. When it comes to complicated organs, the bioprinting field still has a long way to go. Some organs are far more complex than others and thus harder to create by bioprinting or grow in the lab. In 2006, for example, a bladder, a relatively simple structure, was the first lab-grown organ to be transplanted into a human. Bioprinting skin is among the least complex, because it is flat, and made of mostly one dominant cell type. Tubular structures, such as blood vessels, are one level higher in complexity. Hollow non-tubular organs, such as the bladder and the stomach are the third level of complexity. Lastly, the solid organs are the most complex to bioprint, including the heart, lung, kidney, and liver. Scientists are already growing and transplanting the less complex tissues, including the flat, tubular and hollow non-tubular organs. Regarding solid organs, it could take several decades. The human kidney, for example, is incredibly complex, traversed by an intricate system of tiny blood vessels, and around a million small filters known as nephrons. Recently, scientists at the University of Manchester in the UK used stem cells to create functioning mini-kidneys that create urine. The lack of blood supply is a major stumbling block to creating lab-grown organs. The mini-kidneys developed in the UK grew tiny nephrons and capillaries but failed to create arteries capable of feeding a major organ. The blood supply problem needs to be overcome before bioprinting fully-grown organs such as a heart, kidney, or liver. The complexity of larger organs has led many scientists to explore options that don’t include bioprinting organs from scratch but instead use those already designed by nature. For example, some scientists are bioengineering organs from stem cells and growing them on scaffolds, a simpler approach than bioprinting organs from scratch. The idea behind the scaffold approach is to take a pig organ, strip off cells leaving behind the underlying collagen matrix which is used as a scaffold. The process leaves the structure of the organ intact, vasculature and all. Seeding the scaffold with stem cells from the organ recipient eliminates the risk of rejection and means the patient won’t have to spend her life on immunosuppressants to keep her body from rejecting the organ. Technicians place the seeded scaffold inside a bioreactor that bathes the organ in nutrients, simulating the conditions inside the body. While bioengineers have significantly improved scaffold design, enabling effective cell seeding, the current state of the art is far from optimal. While the technology sounds exciting, bioprinting of complete organs is in the earliest stages. Less ambitious uses of stem cell technology are more promising. For example, researchers are using stem cells to create smaller repair patches to fix heart defects. A team at the University of Colorado (UC) Anschutz Medical Campus bioengineered stem cells into patches of heart tissue, complete with the necessary blood supply. The group plans to take the patches, grown on a scaffold from the patient’s stem cells, and use them to repair heart defects in children. Diagnosis, Treatment, and Advice: This article is intended for informational and educational purposes only and is not a substitute for qualified, professional medical advice. The opinions and information stated in this article should not be used during any medical emergency or for the diagnosis or treatment of any medical condition. Consult a qualified and licensed physician for the diagnosis and treatment of any and all medical conditions. Bioprinted organs are experimental and carry a much higher risk than FDA-approved treatments. Dial 9-1-1, or an equivalent emergency hotline number, for all medical emergencies. As well, consult a licensed, qualified physician before changing your diet, supplement or exercise programs.